A similar recipe to our Tiny Tots, but in traditional, flat jerky “squares” which can be broken into still smaller pieces if desired. Ideal for training or as a treat between meals. 2 Benefits: Great for training, Easily break into small pieces. Review: My dog loved these treats. We break them into small pieces for agility training and he jumps for joy! 2 Benefits: My dog loves these treats and I love that they are soft and I can break them into smaller bits for training. 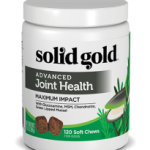 Review: Great addition to the variety of Solid Gold treats that I like to give to my dog. 2 Benefits: Athena gobbles up these treats. They are easy to break apart. Review: These treats are great, I don’t give too many as I’m trying to regulate her weight. As a Senior pug, she has poor teeth and these seem to be ok for her. Review: My dog loved these treats! Since they had a strong scent, I used them for indoor hide and seek (break into small pieces and hide them around the house) – a great exercise for cold winter days. Con: Contains brown sugar and tapioca starch which can spike sugars in some animals (and people). Review: The pets really like these treats a lot. All I have to do is move toward the cupboard where I have them and all 3 animals (2 dogs and 1 cat) come running. The treats are small enough……and because they’re soft, breakable into even smaller pieces…..so a little goes a long way. Review: I love going to the product events. The staff is friendly, outgoing and knowledgeable about all kinds of dogs .It is always a very festive event! It is good to meet other animal owners too. 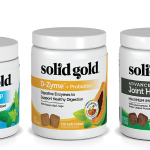 We have been using Solid Gold products for over 15 years. When our first dog was about 4, she was found to have digestive problems that were prompted by copper sulfate in dog foods. When we switched to Solid Gold products she stabilized and lived to 13.She maintained a healthy weight of 65-70 pounds. Our dog now is about 4.5 years old and is a Bernese cross at 130 pounds with a variety of allergies. 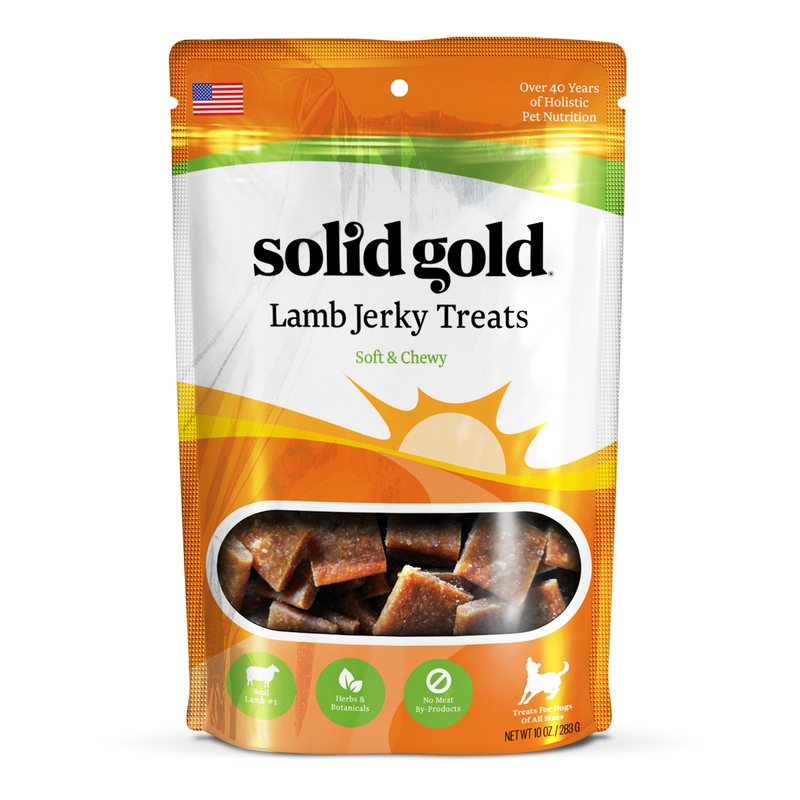 She loves and we love all Solid Gold products, she loves these jerky treats. When our sons 2 Samoyeds come to visit and we get these Jerky treats out it is like a dog stampede…plus they have all learned to do tricks to qualify for getting a few of these treats. Review: I’m happy to find a treat that fits in the Kong ball. Review: These treats are not only highly digestible for my dog with allergies but they’re very easy to cut into small pieces for training treats. They don’t crumble into tiny, unusable pieces like baked biscuits and other products. Very useful in training! !